Assignments over, sorry about the delay through my weekends… I went for a hike and lost my footing so I shifted my balance to stop myself from slipping and also grabbed the nearest plant for assurance: however the plant turned out to be toxic so my right hand has been numb ever since therefore we have had a lack of chapters. My apologies. Zou Liang made his move. Since no went up to the arena, it was his turn, and he patted the person in front of him. Si Kade who was thoroughly pleased with himself suddenly realised that one by one, everybody was turning to look towards the corner and neglecting him. What was this! Everyone said the Asura was cold-hearted and killed people without even blinking. If someone was too slow to dodge, the final result would be a corpse. To die in the arena once would be no big deal since they would not lose much, but in the eyes of the Beast God Martial Artist, it would be a massive loss. “I’ve waited for him for far too long!” Mo Fei’s eyes flashed with a fierce and wild radiance. The reason he had continued mixing in this low-grade area was to wait for this person. It didn’t matter what opponent it was, Si Kade could tear them to pieces with his claws. The Bi Meng were considered to be the strongest existence in the Among De Empire. Once Si Kade saw his opponent, he could not help but to be very disappointed. Actually, many of the people felt that way. Those who had watched the Asura compete were few in number, and the image that each occupational guild had could only be seen by a limited amount of people; this was the first time for many to actually see the Asura. Looking at the Asura like this…… he was too thin and weak. With this kind of physique, it wouldn’t even be enough to fill the Bi Meng’s claws. Not only was Si Kade disappointed, the entire stage was swept with a wave of commotion. This was the Asura? Those thin and slender arms? A lack of armor set for protection? Wouldn’t that just mean a single fist would tear his flesh and cripple his bones? Even a silver-grade warrior would not dare to fight a Beast Transformed Bi Meng in a situation where he hadn’t equipped his armour. Combat techniques and body strength were not enough to resist a blow. Si Kade was a fierce Bi Meng tribe member. He longed to fight a strong expert, but because of the level limitations of the Beast Spirit World, low-grade warriors could not enter the high-grade fighting areas. He would come here to gather some Beast Spirit, but fighting with weaklings really was without substance. “Hehe, you want to make a bet, Mo Fei?” Buaina from Ke Long City laughed. The two would never talk without a quarrel, and during this time they had continuously gained military achievements in the Beast Spirit World. “You first,” the Golden Lion replied with utmost confidence. “Hehe, I’ll bet on Si Kade.” Buaina had anticipated that the other would let him pick first. “I’ll place mine on the Asura, and I bet that he will win effortlessly,” Mo Fei replied. “What stakes?” Buaina’s interest was aroused. “F**k, you sure are ruthless to try and rip someone off like this!” Buaina laughed. “Gathering food for the famine. Three bottles of indigo wave is not something you can’t afford,” Mo Fei objected. “Whatever you want,” Mo Fei answered with indifference while his eyes moved to the battle arena with his own manner of confidence. Buaina did not continue the discussion. This kind of reply confirmed the matchless confidence of the other party; this was a fierce contest between their foresights. The surrounding people were interested in the bet between these two experts, as ten-year-old indigo wave was worth ten gold per bottle. Buaina still had some chance of victory, however; regardless of the Asura’s Strength or Defense, they were still just the unaugmented base values. The Asura was at a disadvantage and his war songs would be next to nothing in terms of effectiveness on a Bi Meng. Honestly speaking, nobody could think of a method to gain victory over Si Kade in this space-restricted arena. Si Kade gazed at the tiny fellow in front of him. Asura? Beast God Martial Artist? He could not endure laughing towards the sky and turned around to look at the spectators gathering on all sides. He waved his two arms and emitted a heaven-shaking howl; he needed acknowledgment! This enticed the loud cheers from the Beast Spirit World. The popularity of a Bi Meng warrior was incomparably high; especially when it came to hand-to-hand combat, people worshipped the Bi Meng, they worshipped their strength just like they did the powerful. Comparing this to the supposed Asura, the latter could only be considered a joke. He was just too small and weak. Faced with the opposition’s arrogance and the cheers from all around, Zou Liang felt tranquility, his mental state very healthy. This was different from the past; the surrounding rallying cheers no longer caused undulations in his heart. Many people looked towards the Bi Meng warrior with anticipation…… and if he were in that crowd instead, he would also pay attention to the Bi Meng warrior. After the cheers came to a close, Si Kade turned and faced Zou Liang. Daring to show his back to the opponent, just how arrogant could he be? 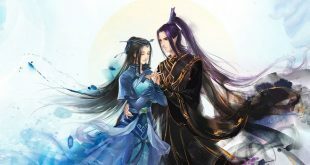 “How do you wish to die?” Si Kade asked, and to the others the words came out like roaring thunder, the result not lacking even compared to the Lai Yin’s roar. A person who had the courage to fight when facing a warrior that was strong in all areas could already be considered a brave warrior themselves. Zou Liang let out an indifferent smile and lightly reached out his finger to place it in front of his mouth. With a single motion he told Si Kade to be silent, and he followed it up by drawing a line across the neck. The Shadow Hunters’ favourite gesture of declaring war! With a hong, Si Kade made his move. He was like an armoured car as the arena shook, his large body surrounding Zou Liang as his large claw swept fiercely downward. The two claws of the Bi Meng were around half a meter long and their fingernails were even sharper than a knife’s edge. Si Kade’s movements were focused on conciseness and on quick and violent motions to conceal his disadvantage in speed. His fast and nimble attacks looked out of place with his body’s physique. In a moment, sweat flowed down. Zou Liang’s “petite” body swam in the blade light. The Bi Meng tribe was indeed a cheat of a tribe; they could actually use such fast and fierce attacks with that kind of large body and their footwork followed closely. All of this was through pure instincts that they did not need any training for. They were pure-born warriors. The battle arena’s four sides let out a heaven and earth shaking howl, a murderous sound shaking the sky. Si Kade was even more invigorated under this kind of cheer, the imposing air like a tidal wave. The opponent was only a tightrope clown, and except for blindly jumping around like a Shadow Hunter he had no other method at all, and in this situation his opponent had no weapon and would be unable to cause him any harm. On the other hand, Si kade was a Bi Meng and only needed to focus on killing, not defending; his job was to tear his opponent to shreds. Seeing his opponent pressured into the corner, Si Kade attacked with both his claws in a cross-attack kill, the same simple technique that had felled many opponents in the past. With a moment, the shadow had disappeared. Bouncing off the Bi Meng’s two arms with a quick pace, Zou Liang arrived at the top of Si Kade’s head and threw a fist at it with a hong. With his nimble movements, even all of the Shadow Hunters present would have to exclaim in admiration. To be able to issue a dangerous sidestep in a moment of a certain kill would require a very stable mind, yet he was up against a Bi Meng. Zou Liang felt his right hand go numb; this rascal’s defence was literally all-encompassing. Facing the opponent’s snarling attack, Zou Liang pulled back his left and borrowed the opponent’s head strength to flip towards the Bi Meng’s back, following it up with a kick straight into the back of the Bi Meng’s head. For a normal warrior this was a vital, but instead it was like kicking a steel plate. Zou Liang felt his leg also going numb before he promptly distanced himself. The circled warriors’ cheers had already stopped. It seemed that it was not that the Asura had no chance to counterattack, it was just that he could not pierce his defence!